Would you like to know how to make cinnamon biscuits? Cinnamon rolls are a sweet breakfast bread often purchased ready to eat in a package instead of cooked at home. One reason this delicious treat is purchased instead of made at home is that it takes so long for the yeast to rise that many people just do not have the time to wait for the cinnamon rolls to get done. My family loves cinnamon rolls, but I usually do not have the time to make the dough, let it rise, then bake it. By the time they are ready, everyone has started their day and it is too late. A few weeks ago, I was getting ready to prepare breakfast. 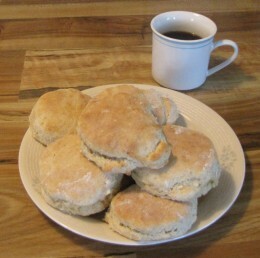 I always make homemade biscuits, rather than biscuits from a can. First, they taste better, and second, I made the mistake of making them for my husband the first week we were married (eons ago! ), and he refuses to eat canned biscuits ever since. So I had my dough done, when on a whim I decided to try making cinnamon rolls with biscuit dough. My family has a new favorite breakfast bread. They are so good, I had to scramble to get the picture before they were all eaten! These cinnamon biscuits are great for weekdays, weekends, or even holiday mornings! You will find my homemade cinnamon biscuits recipe and my homemade biscuits recipe below. I hope you enjoy them as much as we all do. 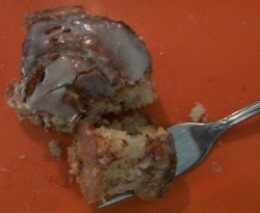 store bought cinnamon rolls again! Preheat the oven to 425 degrees F. Measure the flour, baking powder, and salt into a large mixing bowl. Stir till mixed. Add oil and milk together, then stir until the dough follows the spoon. Knead 10 times then turn the dough out onto a floured surface. Using a rolling pin, roll the dough out into a rectangle until about 1/2 inch thick. In a small microwave safe bowl, microwave the butter 30 seconds or until melted. Add the cinnamon and sugar to the melted butter and stir well. Pour about 2/3 of the butter mixture on the dough, and spread around until it goes to the edges on both long sides and one short side, with the butter mixture 1 inch from the edge on one short side. Roll the dough starting from the short end that has the mixture to the edge. After rolling the dough, smooth and shape it until it is about the same diameter from one end to the other. Use a string to slice the rolls. Floss thread works great. Slide the string under the end of the dough roll, bring the ends up and over to crisscross them and pull until they slice through the dough. This will make rolls without mashing them like you would with a knife. Spray your pan with cooking spray, and arrange the rolls in the pan with them barely touching. After placing all the rolls in the pan, drizzle the remaining butter, cinnamon, and sugar mixture evenly over the rolls. Bake for 20 to 25 minutes. Top with the icing recipe below. This recipe will make approximately 12 large cinnamon rolls if you cut them about 1 inch thick. Add the ingredients to a small mixing bowl, and mix with a wire whisk until smooth. If the icing is too thick add a bit more milk 1 teaspoon at a time. If it is too thin, add a little more sugar. If you add any of these in addition to the vanilla, be sure to reduce the amount of milk used. If the icing is too thin, add a little more powdered sugar. Add a teaspoon of any extract to the icing to make flavored cinnamon biscuits! Nothing smells better than bread baking in the morning! Preheat the oven to 425 degrees F. Mix the dry ingredients in a medium mixing bowl. In a glass liquid measuring cup, measure the oil, then add enough milk to make 1 cup of liquid. Pour the liquid into the dry ingredients. Stir until the dough follows the spoon. Knead the dough 10 to 12 times. Roll out on a floured surface. Use a floured glass or biscuit cutter to cut dough into biscuits, or use a knife to cut into biscuit size squares. Place in an ungreased baking dish. Bake for 20 to 25 minutes until golden brown on top. Serve with butter, jelly, jam, or syrup. Makes about a dozen biscuits. There is more than one way to make great tasting biscuits. 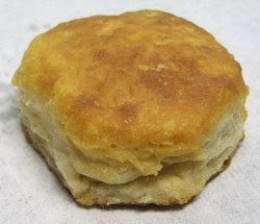 Here are some links to more great tasting biscuit recipes. Perhaps you noticed that I have links to a lot of Watkins products in this article. I love the Watkins extracts and flavorings. They taste better than any others I have ever tried. If you click on any of the product links and purchase the item, I will receive a small percentage of the sale. If you prefer to purchase without providing a small profit to me, you can find the items on Amazon.com. Have you ever tried Watkins products?